How Big Is an 8 Yard Dumpster? 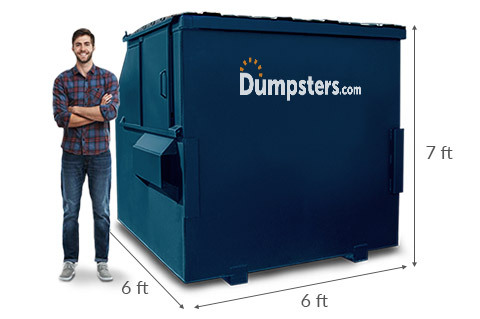 The average 8 yard dumpster dimensions are 6 feet long, 6 feet wide and 7 feet high. These bins hold 8 cubic yards of garbage, which is about 96 kitchen-size trash bags. An 8 yard bin typically has 1,600 pound weight limit. Disposal costs for this amount of trash are covered by our flat rate price. Keep in mind that the weight of your debris can add up faster than you realize. Discuss your trash output with our team to make sure you’ve got the right size for your business. What’s the Price of an 8 Yard Dumpster? 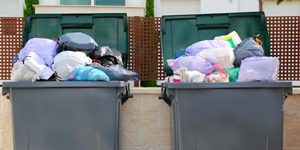 The cost of an 8 yard dumpster rental depends on the location of your business, how frequently your bin is emptied, local disposal fees, taxes and any add-ons you choose. The price of an 8 yard container from Dumpsters.com is an all-inclusive rate based on all those factors, so you’ll know exactly what to expect on your bill each month. Is an 8 Cubic Yard Dumpster Right for My Business? Not Sure You Can Fill an 8 Yard Dumpster? An 8 yard container is perfect for big businesses, but we also offer smaller commercial dumpster sizes. 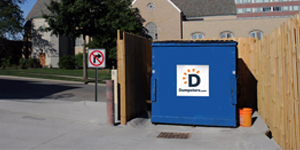 Keep in mind that you can rent multiple dumpsters in different sizes to meet your business’s needs. If you’re not sure which container to choose, give our team a call at [877-880-5286](tel:877-880-5286). We can help you make the best call for your situation. Whichever size you choose, our rental agreements adapt to your business’s changing needs. Just call your team member at their direct extension if you ever need to swap in a different size front load dumpster or change your trash collection schedule. Our team will help you decide how often your dumpster should be emptied and you can change your pickup frequency at any time. With a shorter contract for your 8 yard trash dumpster, you get more flexibility to move or expand than with the usual 3 - 5 year agreements. A lock bar keeps others' trash out so you won’t have to worry about your bin filling up before your scheduled collection. Add for a monthly fee. An 8 yard container can hold a wide variety of common trash items. But there are additional fees for disposing of prohibited items in your container. Please call our team with any questions about what can and can’t be placed in your 8 yard dumpster. Need to Clean Up After a Major Project? If you’re planning a temporary project like a remodel or switching to new office furniture, contact us for a temporary roll off dumpster. These rentals handle the bulky materials from one-time junk removal and renovation projects that can’t be placed in your regular trash.